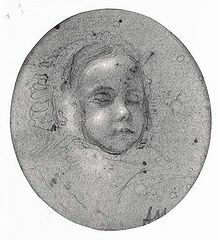 Louis Philippe, Crown Prince of Belgium (24 July 1833 – 17 May 1834), was the eldest child and heir-apparent of King Leopold I of the Belgians and his second wife, Louise of Orléans. He died as an infant. He may have been named after his grandfather Louis Philippe I.
Louis Philippe became crown prince at birth in Laeken. His birth was announced by the sound of 101 cannon shots at the capitol, Brussels. The baby was baptised at the Collegiate church of St. Michael and St. Gudule at Brussels. Louis-Philippe died of an inflammation of the mucous membranes. According to his father, this was completely preventable. His funeral was held on 24 May 1843. He was buried in the Mausoleum of the Dukes of Brabant at the Collegiate church of St. Michael and St. Gudule. He is now burried in the chapel of Church of Our Lady of Laeken (Notre Dame de Laeken), near his family's tomb. This church did not exist at the time of his death. His mother died in 1850 and wanted to be buried at Laeken near the royal residence. Construction for the church began in 1854. It houses the royal crypt where the royal family is buried. A contemporary source recorded his passing: "The family of King Leopold are plunged into the deepest distress by the sudden death of the Duke of Brabant, the heir-apparent to the throne." He was followed as crown prince upon the birth of his younger brother, Leopold (Léopold Louis Philippe Marie Victor), who would later succeed their father as Leopold II, King of the Belgians. Leopold was the replacement child to Louis-Philippe. His tombstone records his titles as: "S.A.R. (Son Altesse Royale or Royal Highness) le Prince Louis-Philippe Duc le Brabant". 24 July 1833 – 16 May 1834 His Royal Highness The Crown Prince of Belgium, Prince of Saxe-Coburg and Gotha, Duke of Saxony. ↑ 6.0 6.1 Marianne van Dam (2006). "Royalty (travel) Guide; BRUSSELS / BRUXELLES / BRUSSEL, Notre Dame de Laeken". M-A-R-D-A-M Royalty Travel Guide (photographs of tomb). Retrieved 16 October 2014. This page was last changed on 20 March 2017, at 11:19.